Vembu SaaSBackup is specially designed for backup of exchange online mailboxes of Office 365 domains. Here, the tenant admin will control the permission and security to access all users of the Office 365 domains. 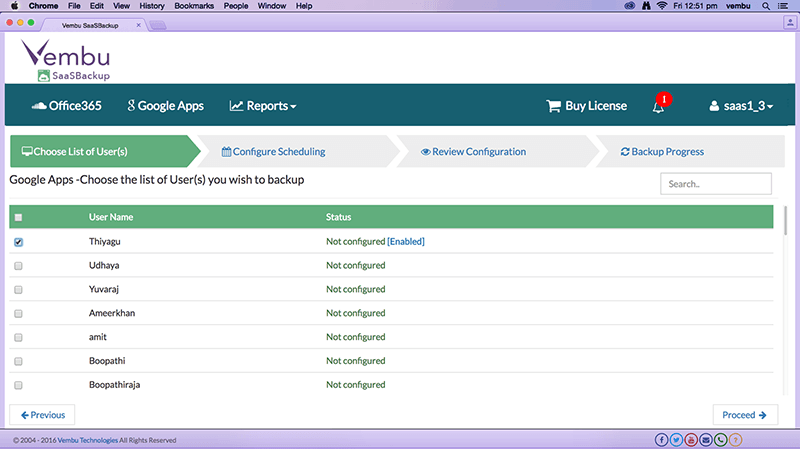 You can configure backup for all domain users or individual user from any domain. Backup the entire exchange online domain including all users’ email accounts or individual user’s email account to Vembu Cloud. It backs up inbox, sent items and other custom labels of exchange online email. Vembu SaaSBackup will store the backed up Office 365 data in Vembu Cloud hosted in Amazon Web Services. The backed up data can be only accessible through secured Vembu SaaSBackup customer portal at anytime and anywhere. 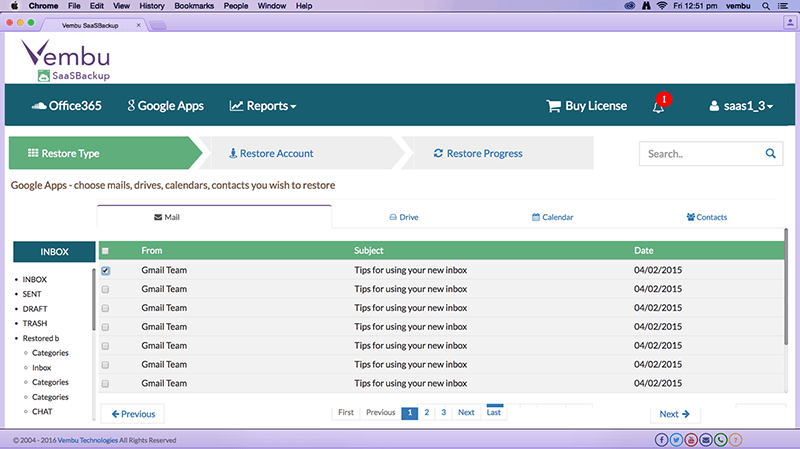 Backup the contacts and calendar of exchange online’s user account to Vembu Cloud. The AES 256 bit encryption algorithm will secure your Office 365 data from unauthorized access while transferring the data over internet and at-rest in Vembu Cloud. From Vembu SaaSBackup’s customer portal, users can do Office 365 mail level restore to same or different user account. 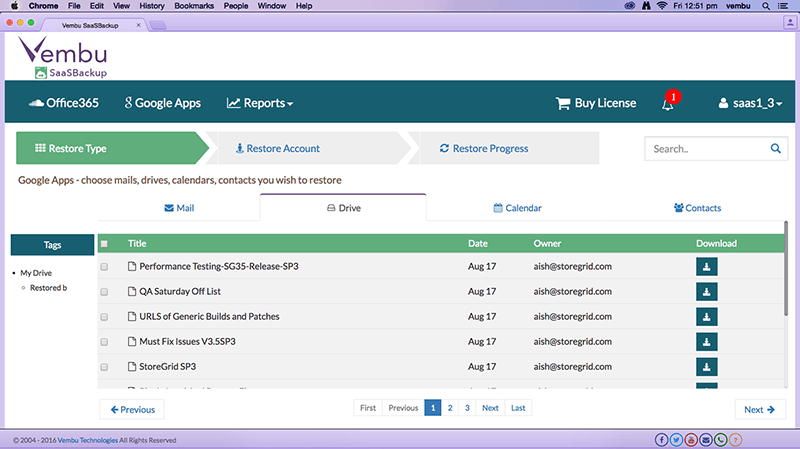 Users can view the individual backed up emails from Vembu SaaSBackup customer portal. Backup all documents from OneDrive to Vembu Cloud. It backs up text documents, spreadsheets, presentations, photos, pdfs etc. from Office 365 OneDrive to Vembu Cloud. Vembu SaaSBackup is designed to backup entire Google Apps (now G Suite) domain account which includes each user’s Gmail, Drive, Contacts and Calendar. Google domain admin will control the permission and security to access the Google domain users. You can backup the entire Google Apps (now G Suite) domain or individual user accounts. Backup the entire Google Apps (now G Suite) domain which includes all users Gmail, Drive, Contacts and Calendar or backup only selected gmail accounts of selected users. It backs up inbox, sent items and other custom labels of Gmail account. Backup all documents from Google Drive to Vembu Cloud. It backs up photos, pdf, text documents, spreadsheets, presentations, forms and etc. from Google Drive to Vembu Cloud. Vembu SaaSBackup will store the backed up Google Apps (now G Suite) data in Vembu Cloud hosted in Amazon Web Services. The backed up data can be only accessible through secured Vembu SaaSBackup customer portal at anytime and anywhere. 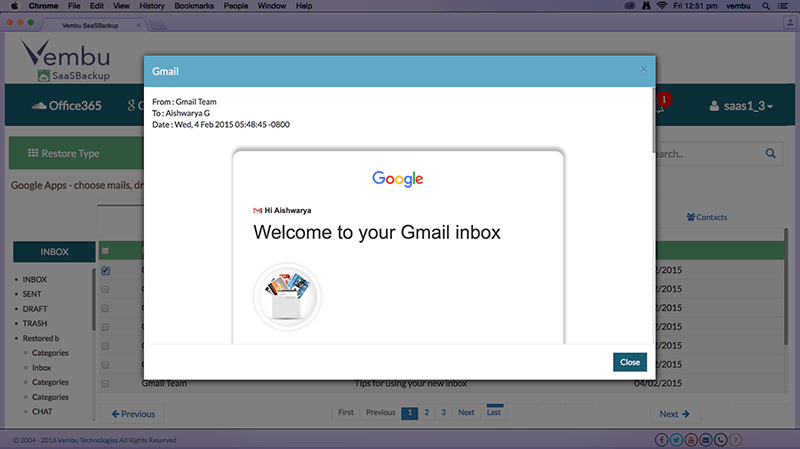 From Vembu SaaSBackup’s customer portal, users can restore individual mail to same or different Gmail account. Backup the contacts and calendar of Google Apps (now G Suite) user accounts to Vembu Cloud. The AES 256 bit encryption algorithm will secure your Google Apps (now G Suite) data from unauthorized access while transferring the data over internet and at-rest in Vembu Cloud. Vembu SaaSBackup runs the Google Apps (now G Suite) and Office 365 backups daily as per the backup schedule frequency. It automatically triggers the incremental backup as per the schedule time. So, you can just configure the backup policy and forget it. 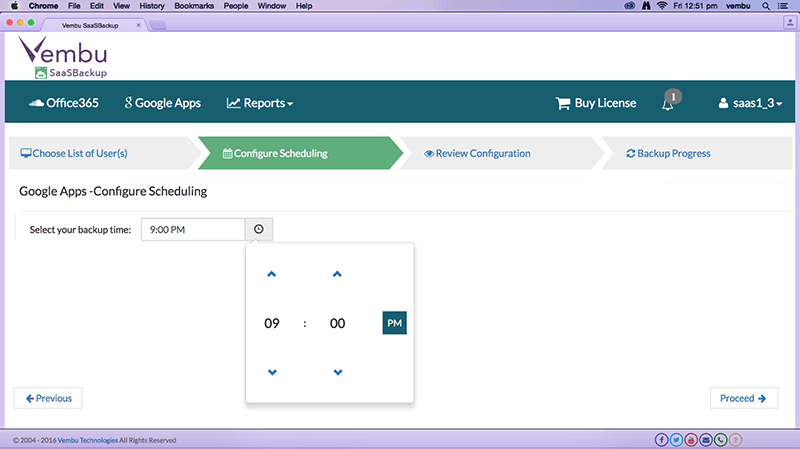 Vembu takes care of incremental backup scheduling. Also, you can manually trigger the backup job when required. If you have thousands of user accounts and would like to backup only specific users, you can use search option available in Vembu SaaSBackup to search the particular user from the list of users while configuring and editing the Google Apps (now G Suite) and Office 365 backups. Search option provides ability to filter email, document, contact and calendar of the particular user while restoring the backup data to the same or different user account. Vembu SaaSBackup provides ability to view the list of backed up Google Drive and OneDrive documents from SaaSBackup’s customer portal without restoring the entire documents. Also, you can download the documents to any machine from anywhere. So, you will get quick access to your business critical documents. Vembu SaaSBackup allows you to view the content of the mail from backed up data. Just click and view the whole content of the mail from the Vembu SaaSBackup customer portal. 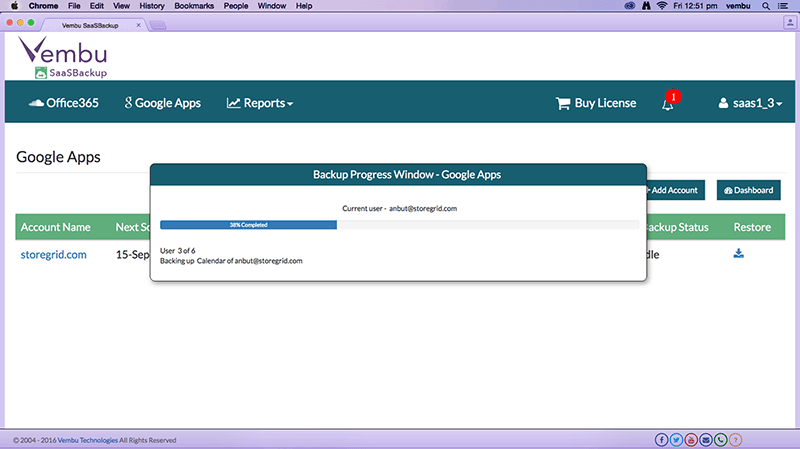 Vembu SaaSBackup provides you with a live backup progress window where you can see the current progress of the backup. It will clearly show you the user and the data currently getting backed up to Vembu Cloud.